With gardening, everything starts with the soil. To me there is no such thing as a green fingered gardener – only brown fingered ones. The better your soil is, the better your crops will be. 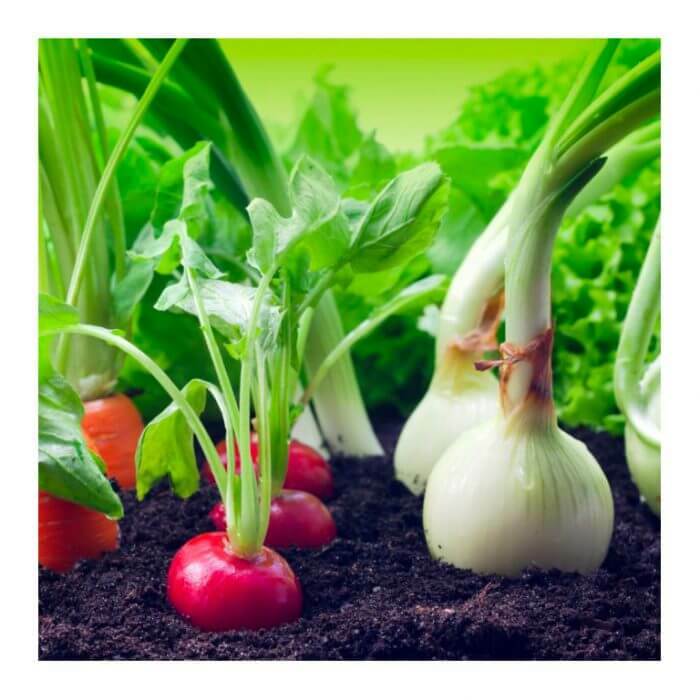 If you manage to create a fertile, healthy and living soil you are already half way there to growing delicious and healthy food for your family. 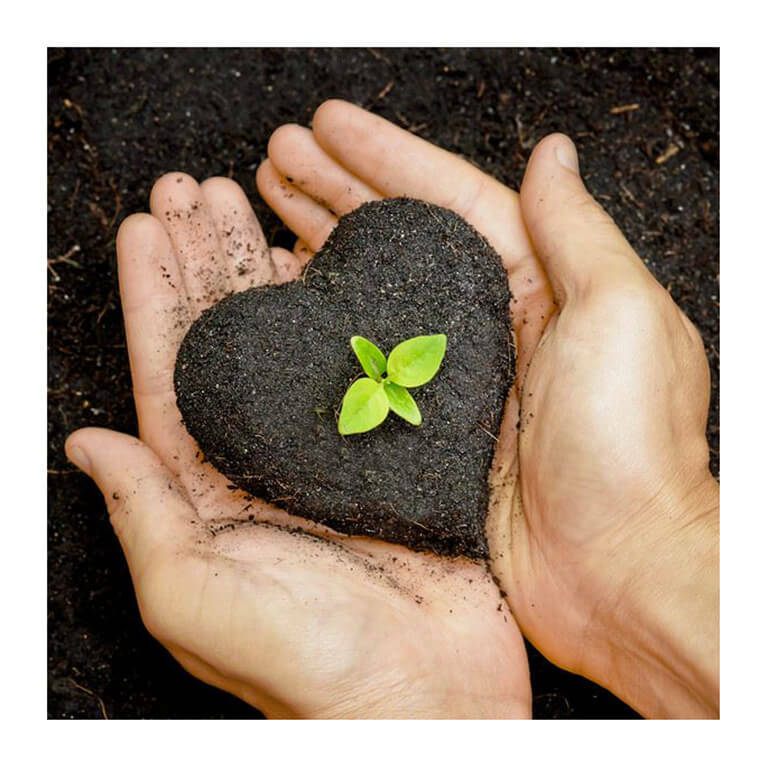 We might not all be blessed to inherit such a soil but what greater satisfaction could there be than to make your soil fertile for your own benefit and for future generations. The good news is that every soil can be made fertile and the magic ingredient to achieve this is what many people nowadays consider a waste product – compost and manure. We completely depend on the soil for our survival on earth. Civilisations that have neglected to look after their soil have perished – they simply couldn’t feed their people any longer. On the other hand, some civilisations (China, Japan) have survived for over 4,000 years because they looked after their soils and learned to observe the cycles of nature. They knew that whatever is taken out of the soil has to be given back in the form of compost or manure. And if we keep doing that our soils will actually get better and better. There is nothing greater we can do than to leave a plot of land more fertile than we found it. This is what we have to understand: what we take out from the soil we have to give back! This is the difference between growing vegetables or ornamental plants. When you grow vegetables you obviously eat them and so take away the nutrients they have absorbed from the soil. These nutrients have to be replenished every year. The trouble is that we as a human race are not aware of this. So far, about 2,000 million hectares of soil have been degraded through human activities – that is 15% of the Earth’s land area, an area larger than the US and Mexico combined. And every year a further 24 billion tons of valuable topsoil are being lost. Soils can counteract global warming: Healthy humus rich soil acts as a carbon sink (carbon deposited in the soil) and can thus counteract global warming. Compost contains a lot of carbon. So quite simply: if we use compost in our garden we take carbon out of the atmosphere and deposit it in the soil. Not even an ounce of bio- degradable waste should be dumped in a landfill site. It should be transformed into the best possible organic fertiliser which will also take the carbon out of the atmosphere. In order to identify the most suitable soil for your vegetable garden go out with a spade and dig a few holes around the garden. Usually the places where grass or weeds grow best has the better soil. A few years ago I was advising a community group who wanted to start an organic market garden. They had already purchased the land and had workers in place keen to get started. The one thing they didn’t do was going out with a spade. When I checked the soil it was simply impossible to get the spade into the ground. It was full of rocks. They had to find another site. Generally speaking, the darker the soil the better it is as darker soils have a higher humus content. Is it a sand, silt, clay or peat soil? Is the soil loose or compacted? How easy is it to break a lump of soil? Does it crumble easily or does it stick together? Obviously the easier it crumbles the better the soil. Are there any worms or worm channels? We all know that worms are our great helpers and diggers. Once you have identified a good sample dig a larger hole in this area about 50cm deep and 50cm wide. This will give you excellent information on the depth of your soil. A soil profile is made up of topsoil, subsoil and the underlying rock. Plant roots need sufficient depth to grow in. A depth of good topsoil of about 30cm is perfect. However 20cm depth is sufficient but more care and effort is required to improve it. On some soils there is a gentle gradient from topsoil to subsoil. You won’t see the clear distinguishing line between the two layers. These are brown earth soils which are very fertile and free draining. Over thousands of years rocks have weathered down into small particles which form the main ingredients of nearly all soils. Thus the texture of the soil depends on the physical location and geology of the area. The texture of a soil is determined by the amount of sand, silt and clay particles present. These are classified according to their size. It is very difficult for us to fully appreciate what goes on in the soil. If we could only see the creatures toiling away relentlessly we would probably take better care of it. A healthy soil is teeming with life. They are tiny, but seen through a microscope they open up a fascinating world of wonders. In one gram of soil, the number of bacteria ranges from 100,000 to several billion. Maybe some figures will impress! In one hectare of good agricultural land (100m x 100m) there are: 20,000kg Micro-organisms, 370kg Protozoa, 10kg Springtails, 50kg Millipedes and woodlice, 17kg Insects, beetles and spiders, 4,000kg Earthworms. All those soil organisms play a significant role in maintaining a healthy fertile soil. If these organisms were not present the soil would have no life – it would die. Their role is to break down the crop residues and other natural inputs and mix them with the soil. As they break down the waste, essential plant nutrients are being made available to plants. They are single-handedly responsible for the renewal of life. And there is another great invention of nature: the warmer the soil, the more active these micro-organisms are and the more nutrients they release. That’s also when plants need more nutrients. So how do we encourage these creatures? We simply feed them with compost, manure, cropresidues, seaweed, weeds, etc. 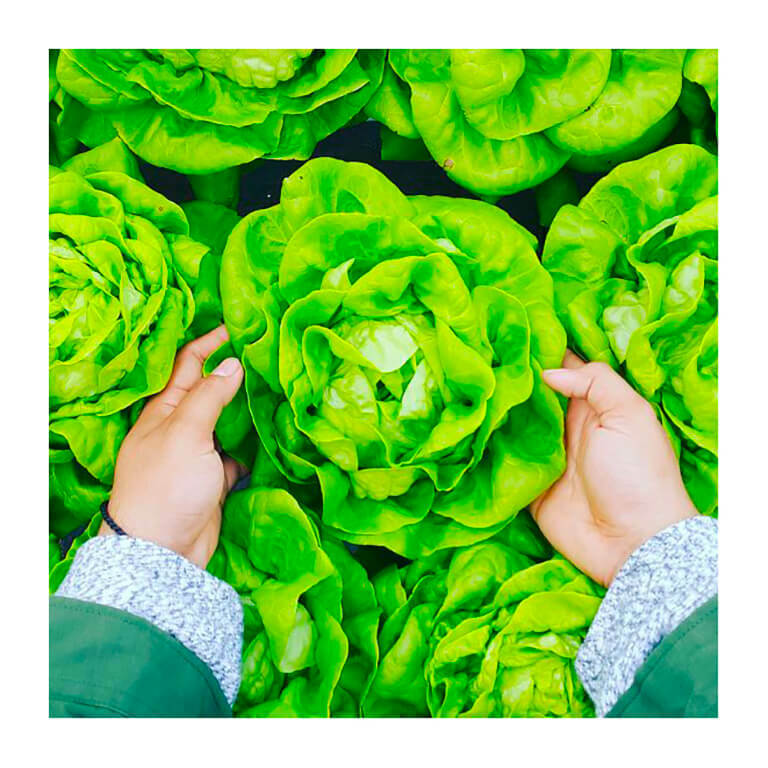 To summarise: A healthy soil produces healthy vegetables, so if your plants are ailing the first question you should ask yourself: is my soil fertile enough? ‘The health of man, beast, plant and soil is one indivisible whole; the health of the soil depends on maintaining its biological balance, and starting with a truly fertile soil, the crops grown on it, the livestock fed on those crops and the humans fed on both have a standard of health and power of resisting disease and infection greatly in advance of anything ordinarily found in this country.’ Lady Eve Balfour, Living Earth, 1943. The soil in your garden may be quite variable. There may be rocky patches where rubble was buried, there may be solid daub good enough for pottery or possibly some excellent dark friable soil which you inherited from days gone by. The proportion of sand, silt and clay present in the soil determines the soil type. Most soils contain a mixture of soil particles. 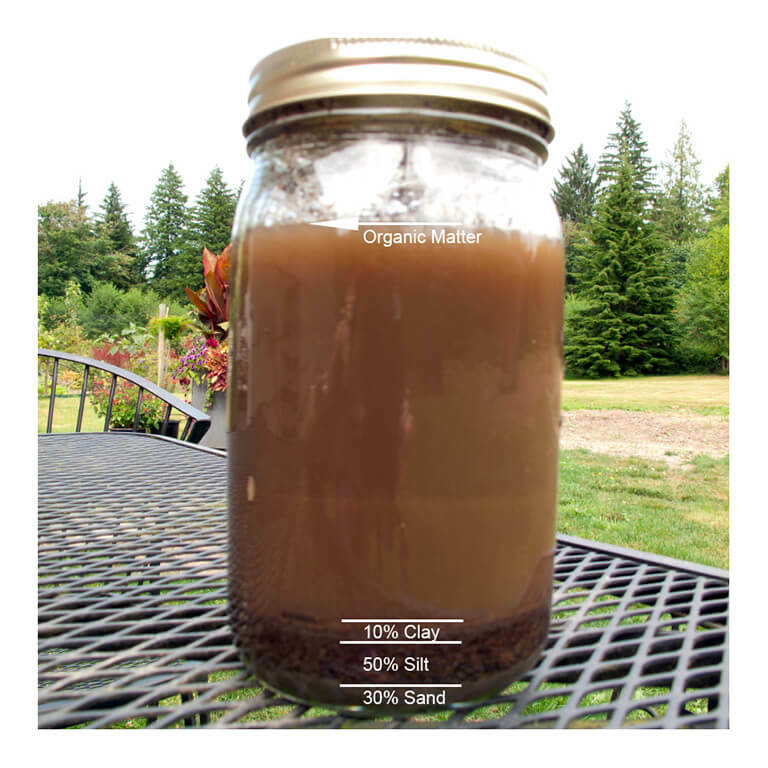 One rough and ready way of determining your soil texture is to half fill a jam jar with soil, add water until it is about three quarters full, add some vinegar, put a lid on and shake it vigorously for a minute and put it down immediately. The vinegar helps to settle the fine clay particles quickly. The various fractions of sand, silt and clay will separate. The sand and any stones will settle within a minute and will be at the bottom. On top of this is the silt which will settle within a few hours and make up the second layer. The clay particles will take over a day to settle and eventually make up the third layer. The test can be analysed once the water is clear. Any organic matter will be either floating on the surface or on top of the clay bits. Take a handful of moist soil and rub it between the thumb and fingers. Clay Soil: The soil sample is sticky and can be rolled into a ball and sausage shape. The higher the clay content, the thinner the sausage will be. Sandy soil: The soil sample feels gritty and makes a rasping sound when rubbed between fingers. It will not stick together or form a ball. Silty soil: The soil sample has a soapy silky feel to it. Sometimes it makes a squeaky sound when rubbed and leaves fingers dirty. Peaty soil: Soil sample looks very dark with a spongy feel. It cannot be rolled into a ball. Characteristics of different soil types Now that you have identified the texture of your soil you know what the advantages and disadvantages are: Clay soils are sticky when wet due to poor drainage and can be as hard as rock when dry. They often crack open in prolonged dry spells. Clay soils also take a lot longer to warm up in spring. On the positive side, clay soils tend to be rich in plant nutrients and leaching of nutrients is less severe than on lighter soils. A silty soil is reasonably moisture retentive and nutrient rich. However, it compacts easily and can be hard to work. Sandy soils are very free draining, easy to cultivate and warm up early in spring. The disadvantages are obvious: they can’t hold water and nutrients very well. Loamy soils contain a balanced amount of sand, silt and clay particles with a fair amount of organic matter. They are the most fertile soils. Peaty soils (or organic soils) are formed where wet acid conditions prevented the full breakdown of organic matter. They are very rich in organic matter but may be very infertile and acidic, but potentially with a very good structure. They can be made very fertile when properly limed and fertilised. 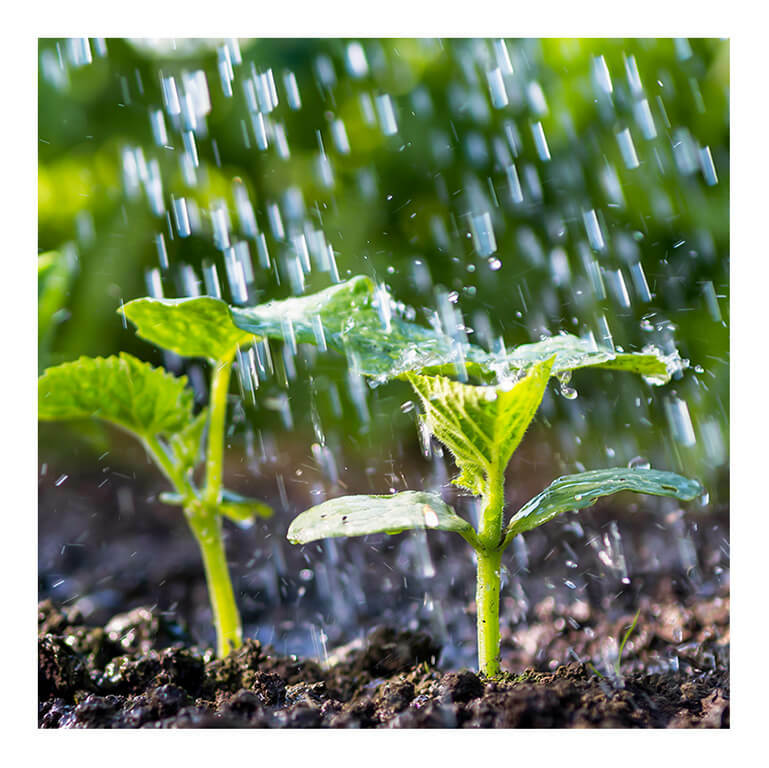 The common combination of bad weather and poor drainage creates great challenges for Irish gardeners. Waterlogged soils take a much longer time to warm up in spring. So be patient and refrain from sowing your crops too early. The soil should be at least 7ºC before most crops can be sown and it may be worthwhile buying a soil thermometer. The main problem of waterlogged soils, however, is that there is a lack of air in the soil. 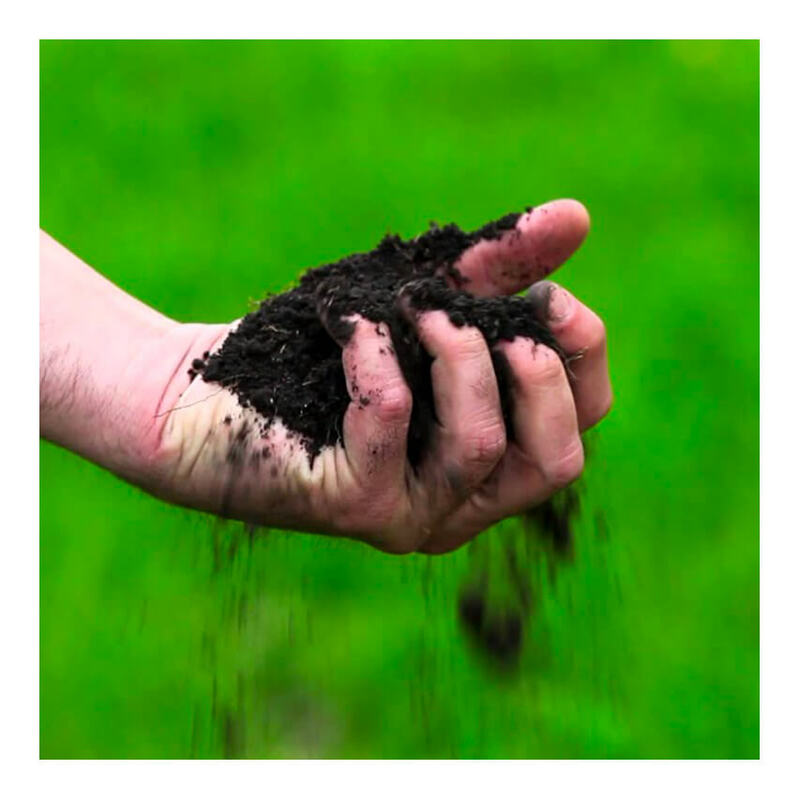 A well-aerated soil is essential for good plant growth and it provides a good environment for the billions of micro-organisms which enliven and improve the soil. To find out if your soil has a drainage problem simple dig a hole about 30cm x 30cm and fill it up with water. If the water drains away within a few hours you have no drainage problem. If it sits in the hole for a few days you have to remedy the problem. How can waterlogging beovercome ? A combination of the above mentioned methods may work best. The pH of a soil influences soil fertility. It is measured on a scale known as the pH scale, which ranges from 0-14. A pH value of 7 is neutral, anything below that is acidic and anything above is alkaline. The pH reading reflects the amount of calcium (lime) in the soil. In our wet climate calcium is continually being washed out of the soil often causing acid soil conditions, especially on sandy soils. pH levels can easily be measured with little pHtester kits available from most garden centres. Most crops thrive well if the pH value is between 6 and 7. If the pH is too low, the following products can be added to the soil: Ground Limestone, Calcified Seaweed (as Seagreen K or Highland Slag). Plants absorb the carbon they require from carbon dioxide in the air. All the other nutrients are absorbed as dissolved mineral salts from the soil. The major nutrients that plants require are nitrogen (N), Phosphorus (P), Potash (K), Calcium (Ca), Magnesium, (Mg) and Sulphur (Su). However, they also require small amounts of so called trace elements which include Boron (Bo), Molybdenum (Mo), Iron (Fe), Manganese (Mn), Zinc (Zn), Copper (Cu) and Silica (Si). These nutrient salts derive naturally from the weathering of mineral particles of the rocks and also through the breakdown of organic matter (compost) in the soil. Even though nitrogen is abundant in the air, plants can’t absorb it. However, plants from the legume family which include peas, beans and clover, can fix nitrogen from the air with the help of soil-borne bacteria (rhizobia). The plants form nodules on their roots which are colonised by the bacteria which, in turn, deposit nitrogen into the nodules which is released into the soil when the plant decomposes. With an adequate supply of compost or farmyard manure and a leguminous crop (either peas or beans or a clover or vetch green manure) in your rotation you will ensure a well-balanced supply of nutrients as well as improving the structure and, thus, the quality of your soil. 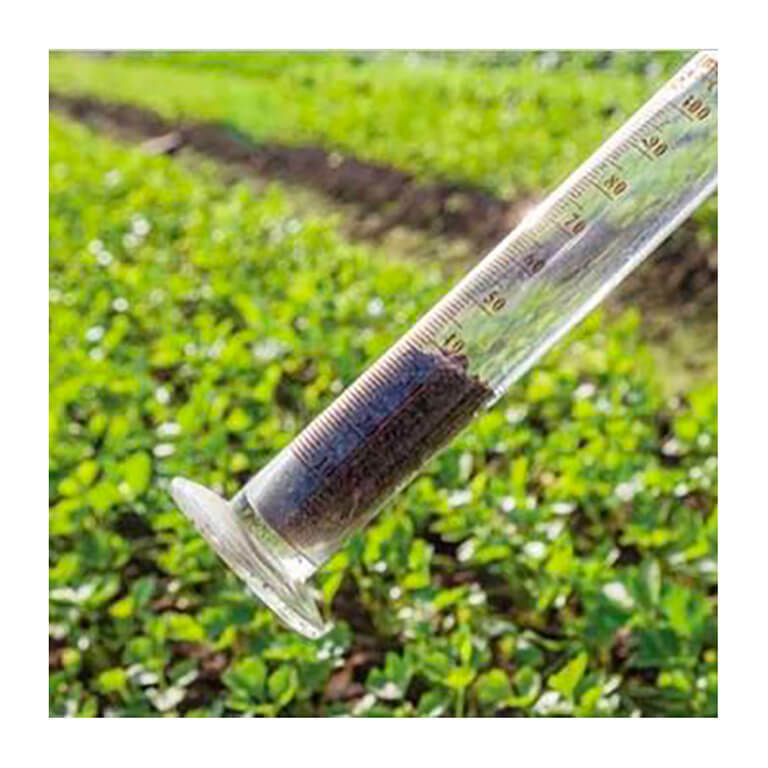 It is very useful to get your soil analysed to find out its nutrient content. This will give you information on the pH level and nutrient content of your soil. If the soil analysis shows deficiencies in certain nutrients some of the following organic fertiliser can be used to supplement but never to replace compost or composted manure: Greenvale Plant Food – NPK fertiliser Rock phosphate-P fertiliser Calcified Seaweed – Seagreen K trace elements + rock potash Calcified Seaweed – Highland Slag – trace elements + rock phosphate + rock potash Seaweed Dust – trace elements. The fertility of the soil depends principally on its structure. If the soil is crumbly and can be worked easily, the growing conditions for the plants are favourable. 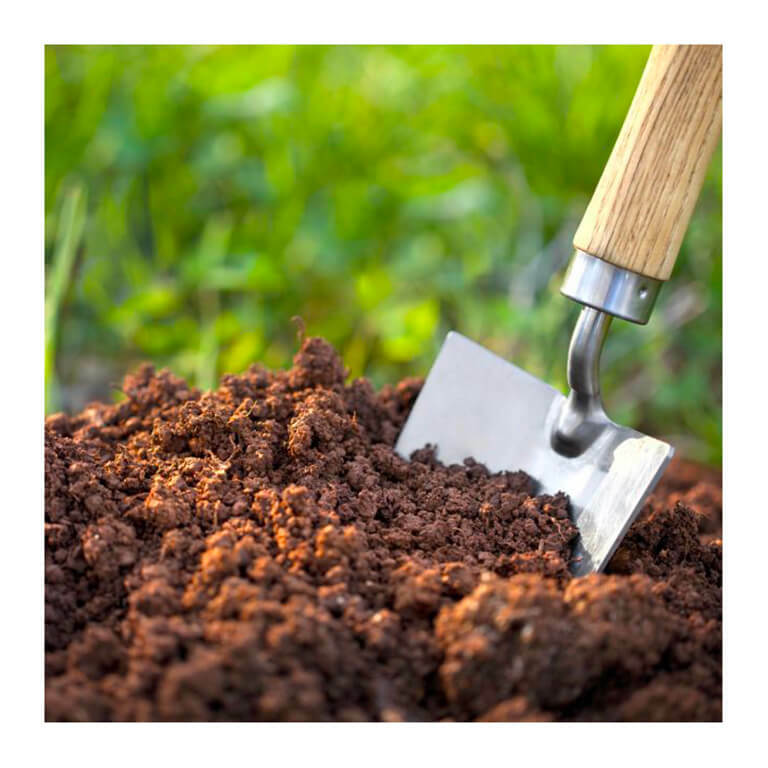 A well-structured soil consists of crumb particles which join the lumps of mineral and organic particles together. The size of the crumbs and especially the spaces between them are very important. Plant roots and soil life need both air and water which are available in these spaces or pores. Poorly structured soils have the tendency to become compact and waterlogged. A good soil structure can be identified by the following parameters: – Soil smells sweet and earthy – Soil is relatively easy to dig – Roots penetrate deeply into the soil – There is no compacted layer – There are lots of worm channels – Topsoil is loose and crumbly (when wet and dry) – Water drains away easily after rain. How to improve your soil ? 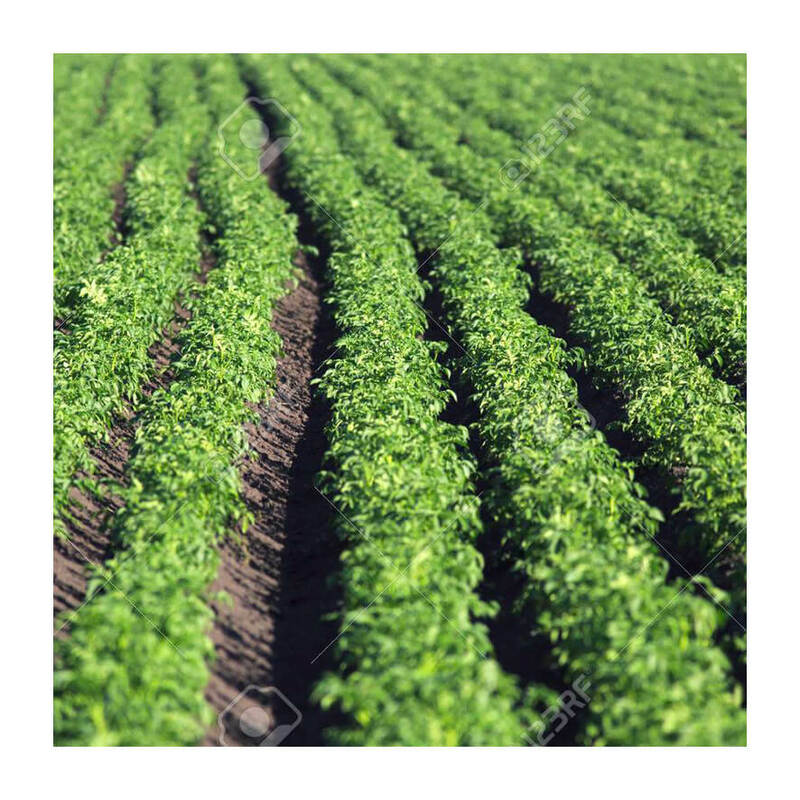 A fertile soil is free-draining, slightly acidic (pH 6-6.8), has a good crumbly structure, is rich in nutrients, has a high humus content and plenty of soil life. Use of good farmyard manure and/or compost If there are no major nutrient deficiencies in your soil, a decent annual application of compost or composted manure will provide your soil and plants with everything they need. Scientists have recently proven that compost can significantly reduce or minimise pests and diseases in plants. Use of mulches It’s the method of covering bare soil with an organic material, such as leaf mould, straw, lawn mowings, etc. The advantages of mulching are manifold. Mulching prevents weeds, keeps the soil moist, provides food for microorganisms and worms and improves the structure of a soil. Caution: Mulching the soil around vegetables in wet climates such as in Ireland will provide a cosy home for slugs which are likely to decimate your crops. Mulching is really not advisable in Ireland unless you live in a dry spot and have a very free draining soil. Mulching in winter, however is very beneficial as the heavy winter rains tend to wash out many valuable plant nutrients into lower layers of the soil. A winter mulch of seaweed is one of the best. Don’t worry about the salt, it will dissolve before you plant your crops the following spring. In one garden close to the sea I cover all the beds in October with a seaweed mulch about 20cm deep. In March the seaweed has nearly decomposed with only a few tough bits left. Underneath it the soil is crawling with earthworms – at least a hundred on each square foot. I carefully put the hard seaweed pieces into the compost and I don’t have to dig because the worms did it for me. If you don’t have access to fresh seaweed (it’s illegal to collect!) you should either cover your plot with black plastic or with a winter green manure to prevent leaching. A well-designed rotation can help improve your garden soil. If you include members of the legume family such as peas and beans – they will fix atmospheric nitrogen and deposit it in your soil. You should also aim to alternate heavy feeders (or greedy vegetables) with light feeders so you don’t exhaust your soil. Examples of heavy feeders include: cabbage, potato, leeks and perpetual spinach; light feeders include carrot, beetroot and onion. If you find that your garden has become exhausted, an excellent way for regenerating it is to take out one quarter of your plot and grow a red clover green manure on it every one in four years for a whole year. Green manuring Green manures can improve the soil fertility in various ways either by adding atmospheric nitrogen (legumes), by increasing the organic matter content, by stimulating soil life, by preventing nutrients from leaching and by growing into lower compacted layers and thus increasing the rooting depth for plants and bringing already lost nutrients back up again. Should I dig over my garden in autumn ? No. Irish conditions are very different. Instead of frost we get rain in winter. Digging in late autumn is only suited to areas with very cold and dry winters where the continuous freezing and thawing breaks down the clumps and a nice soil tilth is formed. In Ireland the rain washes out valuable nutrients and in our relatively mild winters the weeds will continue to grow. The soil literally turns into mash and becomes waterlogged. In a waterlogged soil all the soil pores are filled with water leaving no space for air. A soil without air is unable to support aerobic life (earthworms etc). How much compost or composted manure should I apply ? It depends on how fertile your soil is. On a fertile soil one bucket of old compost per 2sqm should be sufficient to maintain soil fertility. On an average soil 1 bucket per sqm. On a poor soil 2 buckets per sqm. Can I make enough compost to feed my vegetables ? The answer is no! You need to supplement with manure, seaweed etc. When and how often should I spread compost ? Every year you harvest vegetables and thus take nutrients out of the soil, so in theory you need to replenish the soil every year. As you will see in the vegetable section, there are some vegetables that are greedier than others. 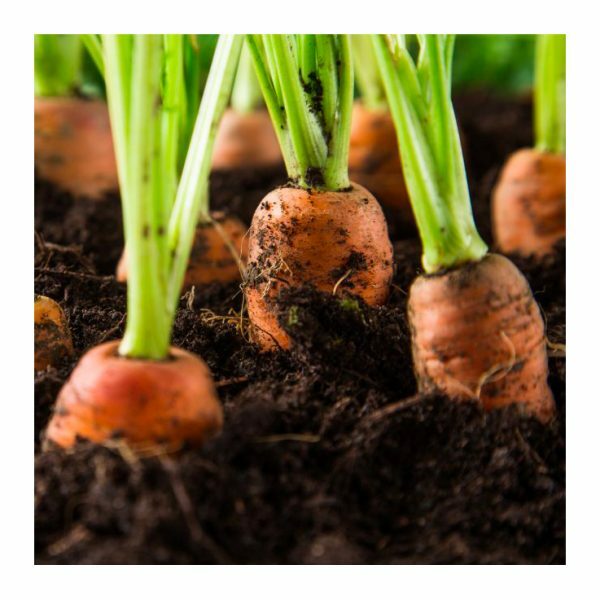 The less greedy ones such as carrots need very little or no feeding, but if your soil is quite poor they will certainly benefit from an application of very well broken down compost.